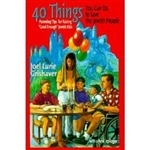 Through captivating stories, Joel Grishaver shows us how to put the "Jewish" into our lives easily and meaningfully. "No matter where we live, our Judaism can always be handmade. The truth about Jewish life is never the numbers. It is the stories we tell. Just reading this book will transform your thinking about Jewish life.